October Home Design: French-Inspired Kitchen and Bath Photos – Design Your Lifestyle. 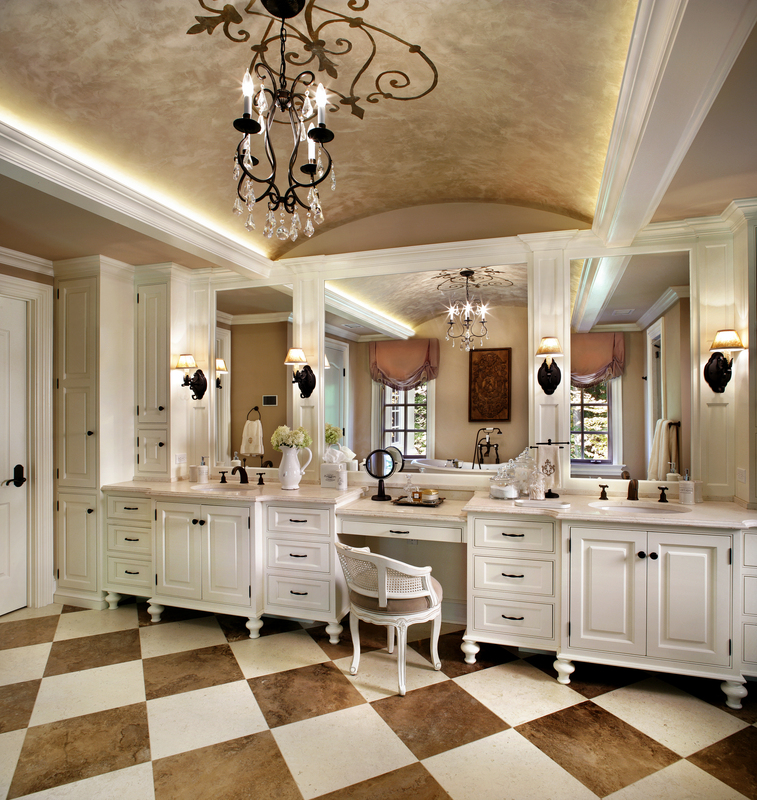 It’s hard to believe that it’s been three years since our blog first introduced you to a stunning French-inspired kitchen and bath design by Peter Salerno Inc. (the most award-winning North American kitchen and bath designer since 2002). The design trends present in Fall 2016 certainly tell us that everything about this gorgeous kitchen and bath design is still quite relevant – and very much in vogue! At first blush, one would assume these design photos were taken in a French home. From the rustic, unpolished stone (evocative of the Vence region) to the exposed kitchen ceiling beams and the exquisite white claw foot tub, the design seems lifted from the French countryside. In reality, these photos (courtesy of photographer Peter Rymwid) are of a home in Princeton, New Jersey. A 2013 visit to the French countryside certainly inspired master designer Peter Salerno and his team along the way, and notable French design elements fill this masterpiece. As noted, the exposed rustic stone embedded around the kitchen door frame is reminiscent of the stone work found in France’s Vence region. The hand-painted custom cabinetry draws from the Picardie region. The bath design (a 2014 Best Bath Design national award winner) incorporates a dramatic arched center ceiling, Maestro Rosolino custom cabinetry, checkerboard tile and a claw foot tub that is a pastoral design lover’s dream. Looking at this design in 2016, it’s astonishing to see how many future design trends and color palettes were predicted by Peter Salerno Inc. Fall 2016 has declared alluring neutrals as “new mainstays” in home design. Tones from Pantone’s Fall 2016 color report like Potter’s Clay and Warm Taupe tie directly into this kitchen and bath design. Touches of blue add a fresh, bold accent tone to the kitchen design. Chief among these is (of course) a La Cornue range in French blue, seen in the photo below. 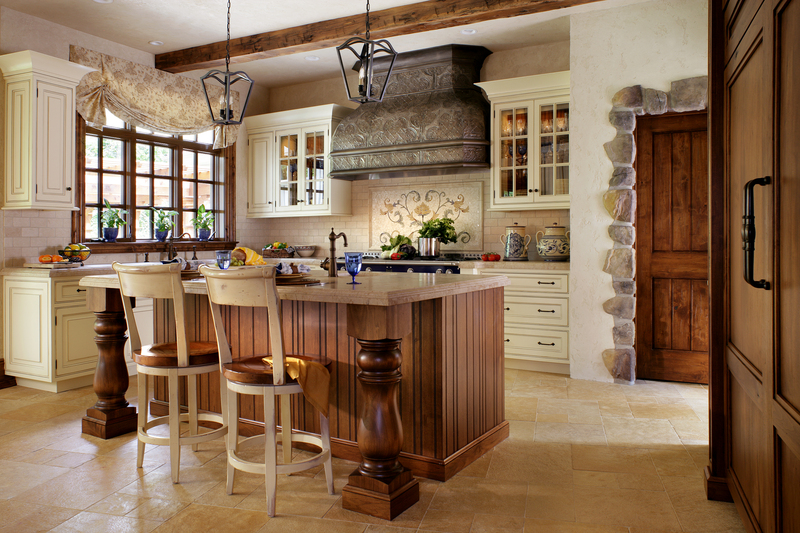 The handcrafted center island and custom tin range hood are luxurious, personalized options that help make this French-inspired design unique. 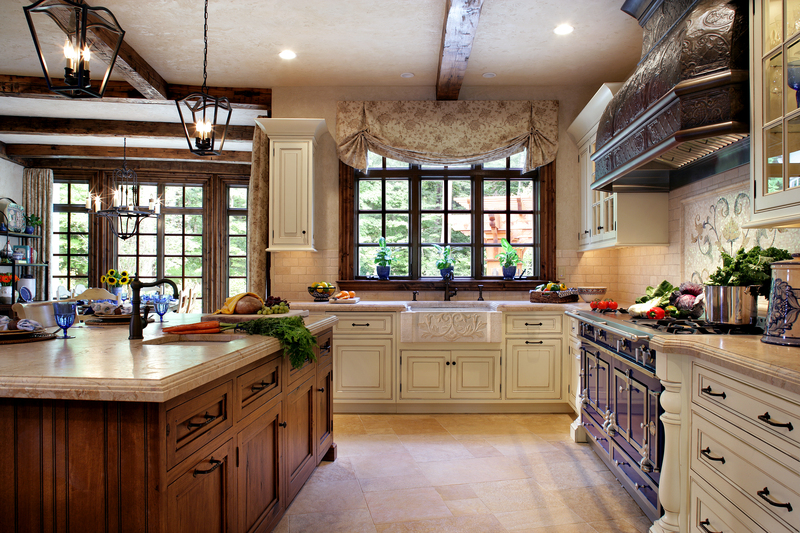 Alternate view of French-inspired kitchen design by Peter Salerno Inc. in Princeton, NJ. What’s your favorite aspect of this French-inspired kitchen and bath design? Is it the handcrafted cabinetry? The seemingly endless amount of ambient light? The rustic feel of design elements like exposed stone and ceiling beams? The opulence of the bath ceiling, chandelier and wall-to-wall vanity? We’d love to hear from you – tell us what you love about this design in the comments! I loved this round-up post. It is great to see all these picture collected in one place. Your designs are really interesting to all. I like your put up because it is quite useful for me as nicely.